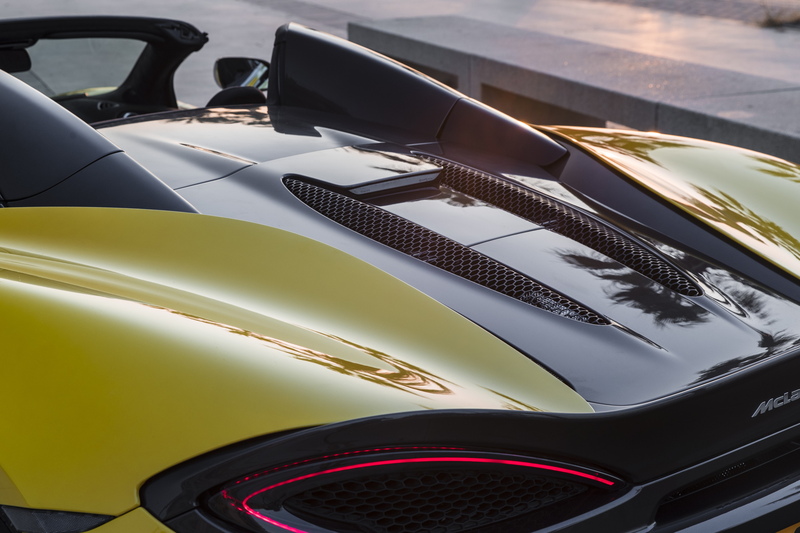 Why would you not have a McLaren 570S Spider over the Coupe on which it is based? A quick test of your assumptions. It’s slower, right? Nope, unless you count a dropped tenth from zero to 124mph or reduction in top speed from 204mph to 196mph when you drop the roof as serious challenges to your virility. Okay, so it’ll have the structural integrity of a soggy cardboard box and the suspension will have been softened to compensate. Wrong again. The chassis settings are identical to the Coupe and, although it’s carrying an extra 46kg, the Spider’s carbon fibre tub requires no additional bracing or reinforcement to offer exactly the same chassis stiffness. Or so McLaren claims. In theory then the driving experience should be all but identical. Just with the choice to make it a bit draughtier if the mood takes you. Is it as credible though? For some a soft top (even if it’s actually a folding hard top) will always be the soft option. Time for McLaren to try and prove otherwise. Driving impressions are more interesting than number crunching of course, but indulge one stat comparison with a key rival: the new 610hp V10 Plus version of the Audi R8 Spyder. Sitting before you fuelled and ready to go these two are pretty closely matched by all the important numbers. All but one. Well two. The one that matters in the way they drive though is weight, the Audi carrying 200kg more than the McLaren. A Porsche 911 Turbo S Cabriolet – another key rival – is 172kg heavier. 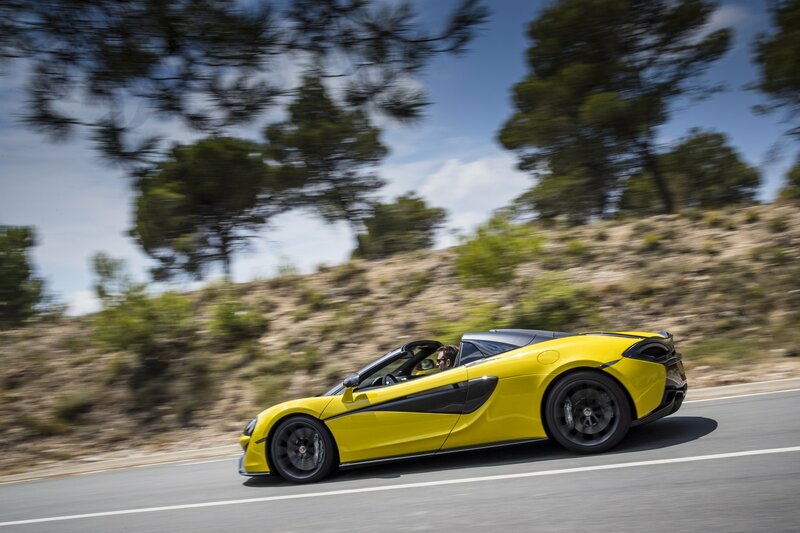 In theory then the 570S should feel something like a Lotus Elise in comparison, just one with nearly 600hp. And doesn’t that sound like an appealing prospect! About that other important number. Less weight is all very well. 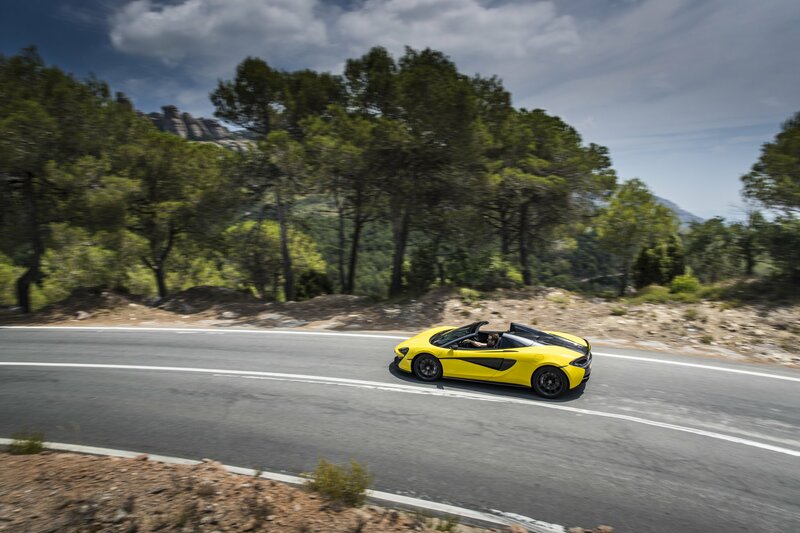 But it does come at quite a premium because this 570S Spider costs the best part of £20,000 more than that Audi. And nearly £10,000 more than the Porsche. How to impress those not fixated by kilograms and chassis stiffness it’s worth that much more? 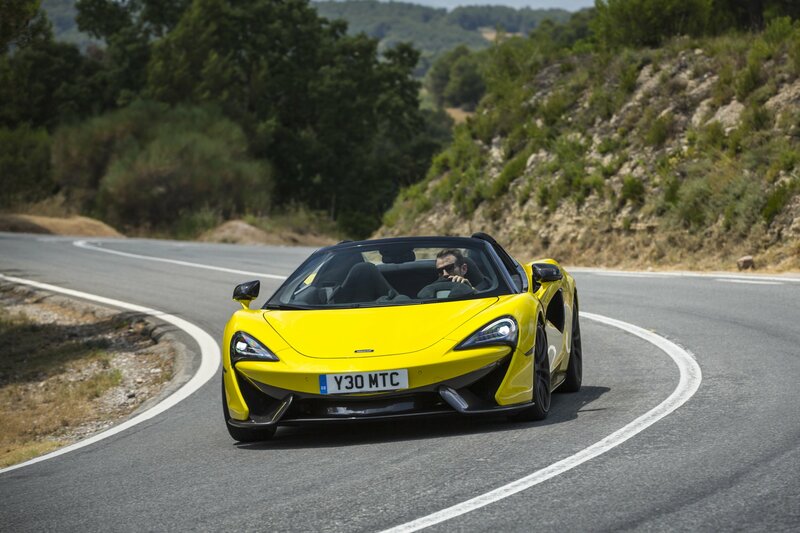 Well, if the kudos of holding a McLaren key, the searing Sicilian Yellow paint or the exotic dihedral doors don’t impress them you could take them for a spin. With the roof up they might not even realise they were in a convertible at first. Because they’ll more likely be taking in the stylish minimalism of the cockpit than noticing the hinges of the roof mechanism above them. 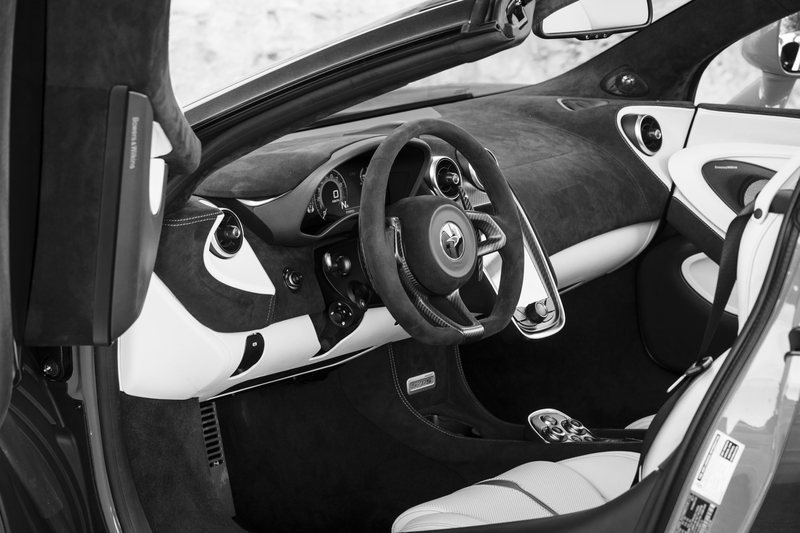 McLaren wants you to focus on the experience so, unlike the Audi in particular, there are no buttons on the steering wheel and most of the interaction with the car is through a vertically-oriented touchscreen placed within easy reach of the wheel. 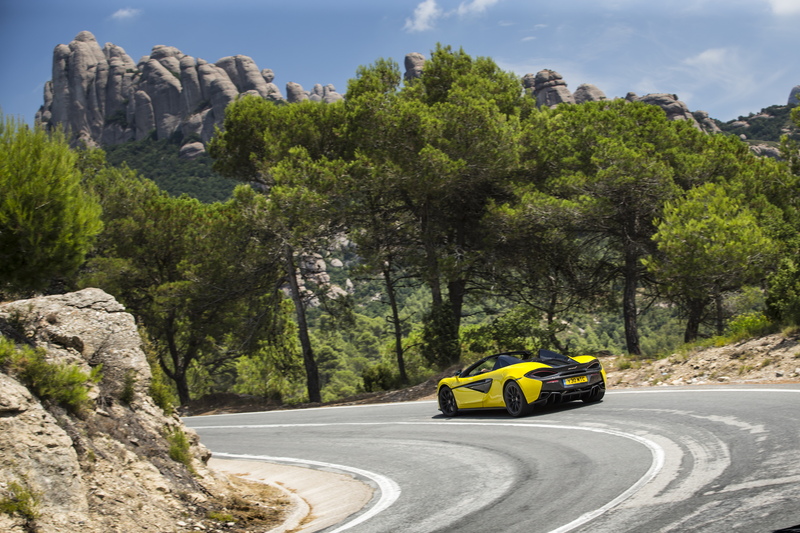 You get an amazing view of the road ahead in a McLaren, the incredibly low dashboard giving a sense of the fast-moving scenery in wonderful widescreen, high-definition clarity even with a seating position seemingly centimetres off the road surface. 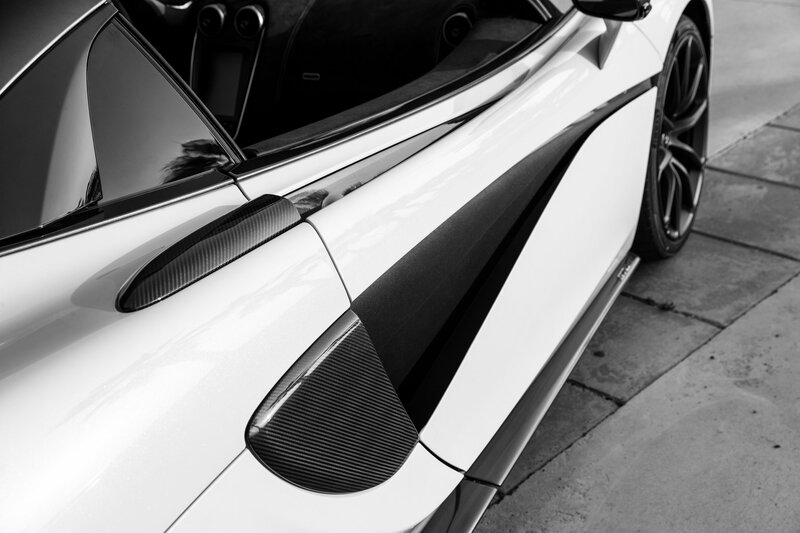 This connection to what the car is doing is a vital part of the 570S experience, the feedback through the steering wheel, pedals and chassis uncorrupted by the need to contain hundreds of extra kilos. 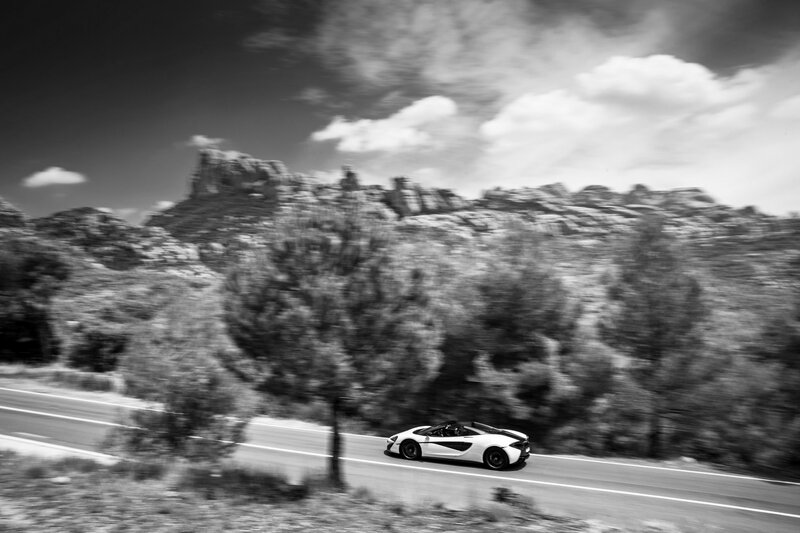 Because it’s relatively light the McLaren can run softer suspension to remain comfortable and composed even when you’re absolutely on it. It’s this sense of flow the heavier rivals can’t compete with and, yes, where that Lotus comparison finally makes sense. No Elise has ever gone this fast though. 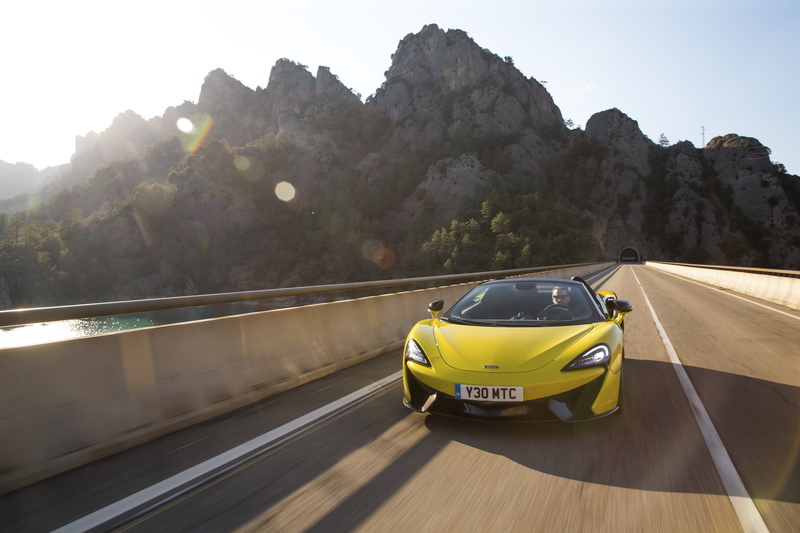 What McLaren’s turbocharged V8 lacks in character it more than makes up for in pure power, the old-fashioned turbocharged rush meaning you rev it out and thrill at the sense of riding a lit firework when the boost erupts. Again, that lack of weight helps too, there being the sense that nothing is holding the 570S back. And it’s beautifully balanced in the corners too. 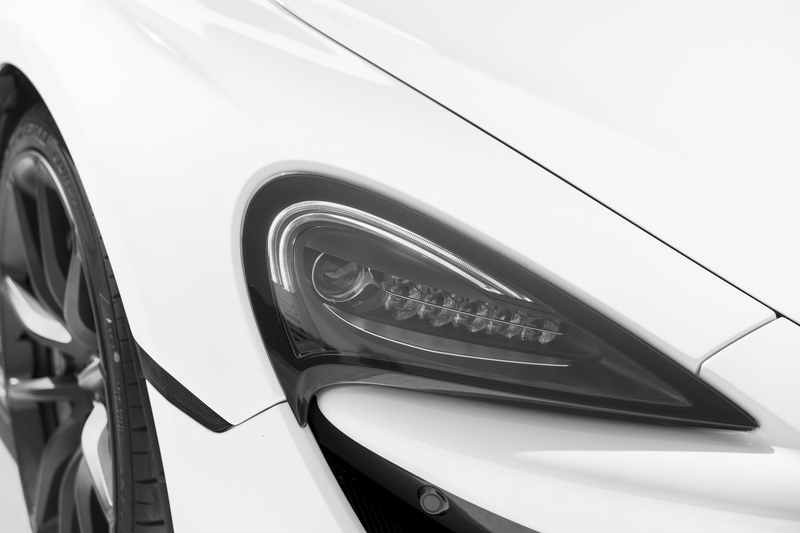 With relatively little inertia to cope with the response to the wheel is instant, the grip from the front-end bleeding out into a fabulous sense of balance through the corner. 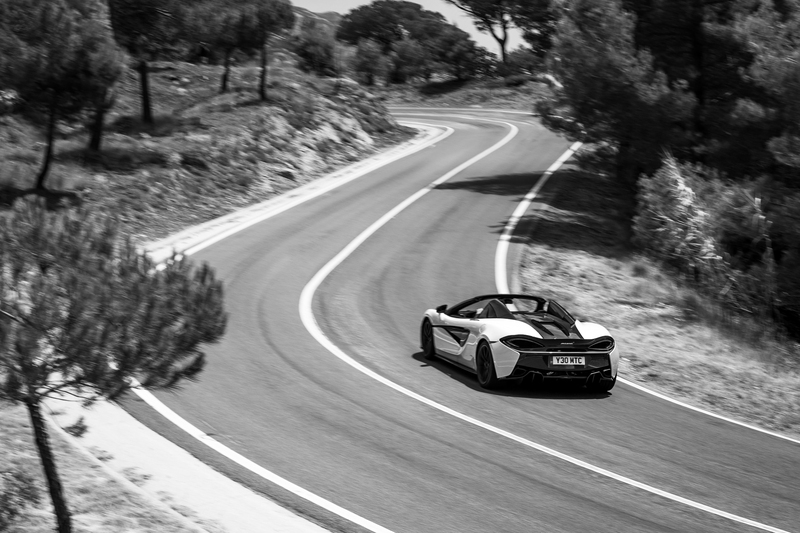 Technology is helping you here – McLaren’s ‘too clever for F1’ Brake Steer system included – but it’s always subtle and in the background, not dominating the experience like Porsche’s four-wheel steering or Audi’s baffling array of driver modes. 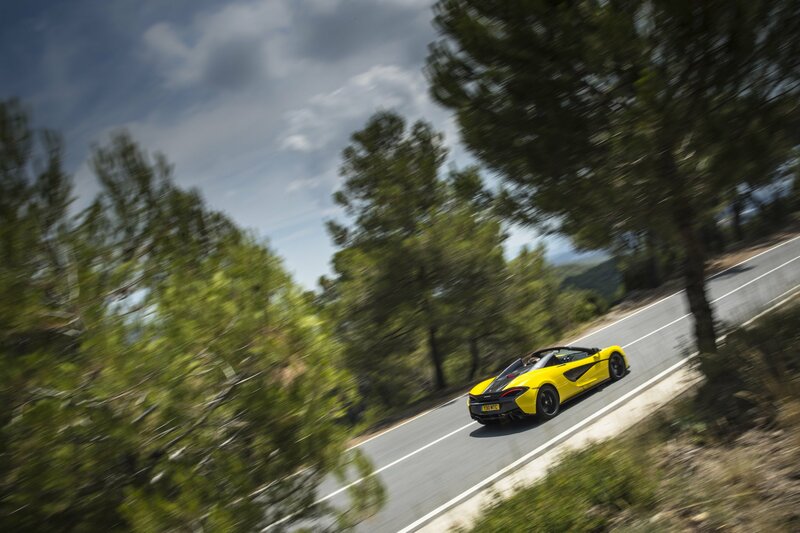 In common with all its cars, McLaren gives you three steps on both Handling (suspension stiffness, in other words) and Powertrain (throttle and gearbox response) to dial in according to mood. The midway Sport on both – with the manual gearshifts – is probably the best balance for the road, though the bangs and pops you get as reward for really going for it in Track are rather fun too. You get all of this in the 570S Coupe of course, and for £20,000 less. What you don’t get, and is harder to put a price on, is the thrill of experiencing it in the open air. 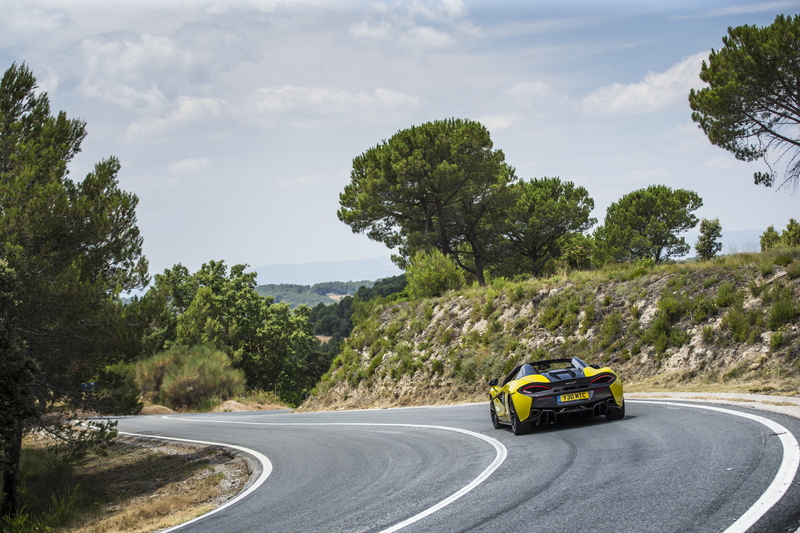 The bark of the engine, the whistles of the turbos, the whipcrack bangs on redline upshifts – you’re so much closer to the action with the roof stowed and the sun beating down along fabulous roads like those used for our Spanish introduction. Even if you don’t have scenery like this on your doorstep it’s this that makes the Spider a more exciting experience along any given road. The Coupe would be a lovely thing to have on your driveway. But you’re more likely to set an early alarm on a Sunday morning and just go out for the sake of it in the Spider. And isn’t that what a car like this should inspire? Hand on heart the Coupe and the GT are better looking than the McLaren 570S Spider, not to mention significantly less expensive. 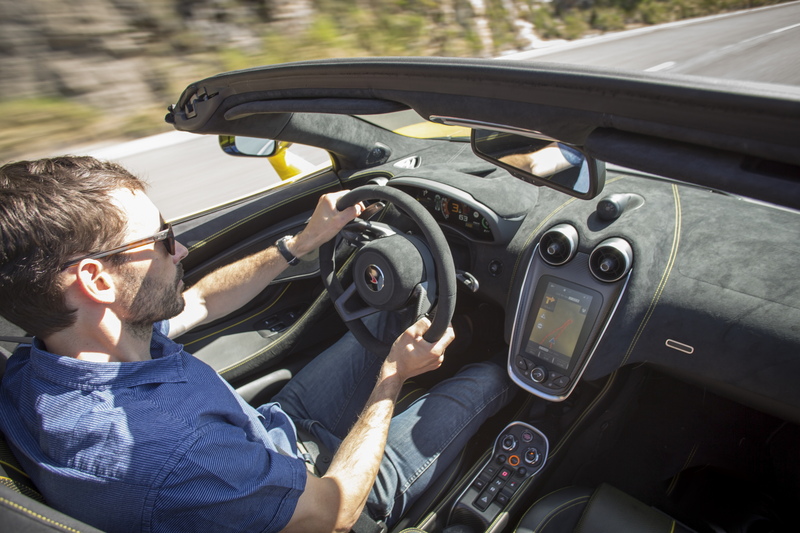 Some people will always look down on the open-top car for being the poser’s choice too – that question of credibility mentioned at the start. These are all first world dilemmas you’ll have to face if you’re in the lucky position to be able to buy a McLaren Sports Series. One you won’t have to dwell on is whether you’re making any dynamic compromises for the ability to soak up the sun at speed. Because as a driving machine you absolutely aren’t.